Image Size: 14 X 12 in. Art comes gallery wrapped ready to hang! Artist Stephen Lyman was as likely to turn his attention to the seemingly insignificant (plants, trees, rock formations) he encountered along the trail as he was to focus on the impressive and captivating “megafauna” such as bear. He considered himself, in this regard, a painter of the wilderness, not a wildlife painter. 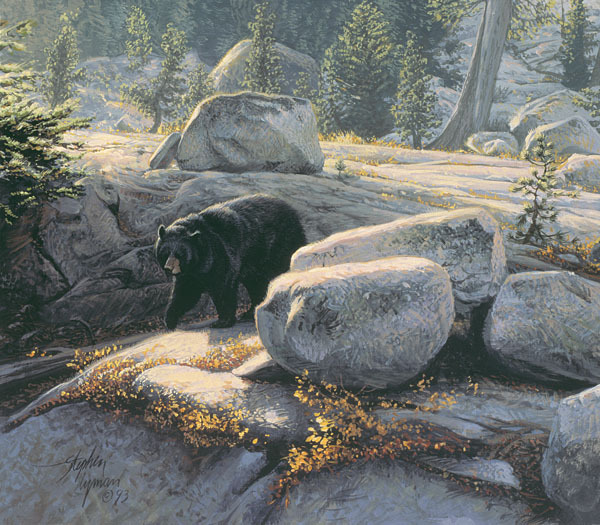 Boulder Bruin, a previously unpublished jewel by Stephen Lyman, is an example of his ability to capture wildlife in an environment that provides both scale and a glimpse of the animal’s habitat. More often than not, that location was in the artist’s beloved Yosemite National Park.